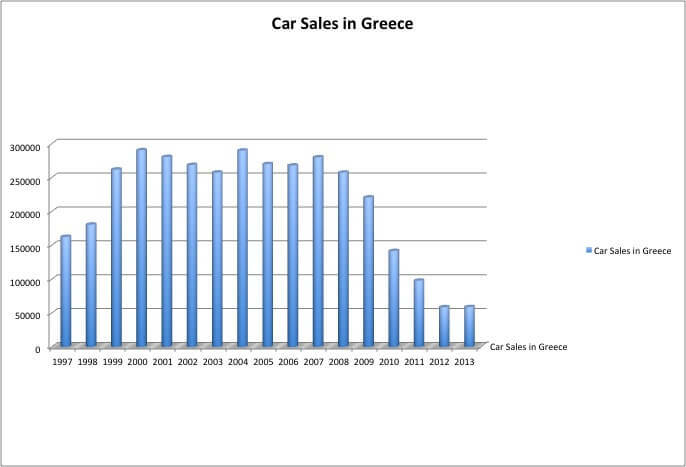 In 2013, the Greek car market grew for the first time since 2007. Toyota surpassed Volkswagen and Opel as the best-selling car brand in Greece. In 2013, new passenger vehicle registrations in Greece increased for the first time since 2007. However, the growth was only 0.4% leaving the Greek car market at around a third the size it was 15 years ago or a fifth of its peak in 2000. In 2013, Toyota regained the top position as best-selling car brand in Greece ahead of Volkswagen and Opel. The Greek car market grew by 0.4% to 58,694 new passenger vehicle registrations in 2013. Although the growth was small, it was the first time since 2007 that the Greek car market grew at all over the period of a full calendar year. The Greek car market was 162,338 cars in 1997 and reached a peak of 290,225 cars in 2000. Fueled largely by low interest rates courtesy of the euro, from 1999 to 2008, the Greek car market exceeded 250,000 cars annually. However, when the cheap credit ran out, the market crashed fast and deep. 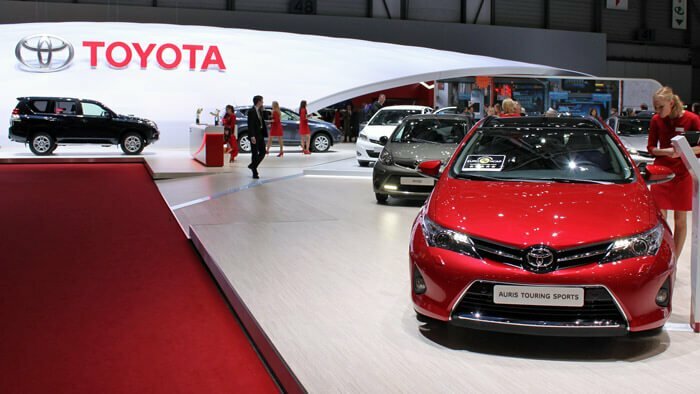 In 2013, Toyota regained the top spot as most popular car brand in Greece. Last year, Toyota was only third but it has been the strongest selling car brand in Greece for most of the past decade. Volkswagen maintained its second place for the second consecutive year in Greece. Opel was the worst performer of the top brands and slipped from first last year to third with sales down by more than a fifth. Hyundai saw sales improve by more than 50% – in contrast sales of fellow South Korean brand Kia fell by more than a third. Hyundai climbed five rank positions. Fiat and Nissan had solid growth while Citroen saw sales in Greece in 2013 fall by a fifth and slipped from fourth place last year to seventh. VW-owned brands Skoda (+12%) and Seat (+58%) both enjoyed very good growth while Ford and Suzuki sales were weaker in Greece in 2013. The German luxury brand trio – Audi, BMW, and Mercedes – had a record 2013 worldwide and also managed to increase car sales in Greece in 2013. Audi sales were slightly better while BMW saw sales increase by a third and Mercedes Benz sales were up by almost half. In contrast, Porsche sales were down 68% to only 8 cars sold on the Greek market in 2013 – in 2007, Porsche sold 562 cars in Greece.